Don’t think about it just yet. 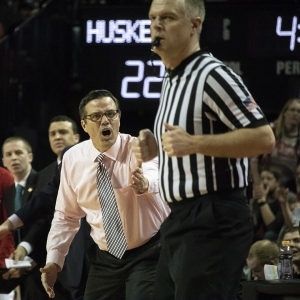 The seemingly inevitable dismissal of Tim Miles can’t rain on the Husker’s parade after their energizing first round win over Butler in the NIT. That’s right, the NIT. One could’ve been mistaken if they were amongst the Husker faithful at Pinnacle Bank Arena Wednesday night. The environment felt like the sweet 16 of the NCAAs, not a first round mid-week consolation tournament game. 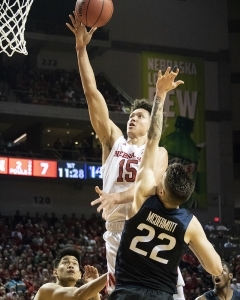 The fans at Pinnacle Bank Arena had a manic energy about them, stomping their feet, and howling at the top of their lungs at eardrum bursting volume. Nebraska forward Isaiah Roby drives past Butler’s Sean McDermott for two points during the first round of the NIT Wednesday night. Things didn’t start off on the right foot for NU, though. The only Husker who looked like he had any interest was Isaiah Roby. Midway through the first, he had all 11 of NU’s points. 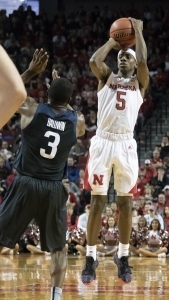 Not until Glynn Watson’s three ball at the nine minute mark did another Husker contribute anything offensively. That three point shot from Watson made it a five point game, 19-14 Butler. Later on in the first, Watson would again find his stroke from beyond the arc to erase the Bulldog’s lead, to tie the game up at 22. A three pointer and second chance layup gave Butler another five point lead soon after Watson’s tying basket, but James Palmer Jr. responded by scoring the next 7 points in the game to give the Big Red the edge, 29-27 with 1:10 to go until the halftime buzzer. 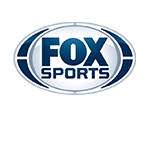 Jordan Tucker hit one from downtown to take the lead back with 50 seconds to go in the half, but Roby was not deterred, marching down the court and jamming it into the hoop in emphatic fashion to take a 31-30 lead. Butler air balled their last second three point attempt, ensuring NU would take their lead into the locker room, after trailing by 12 points to start the game. Roby was on a mission. He had 17 points at halftime. He would finish with a career high 28. If the first half was any indication, the second would not be easy going for either team. That’s when tensions began to heat up. With the game tied at 38, officials awarded a double technical on Glynn Watson and Aaron Thompson after a minor scuffle underneath the basket on a dead ball situation. The Bulldogs got the ball, and connected on an alley-oop to silence PBA, but Watson responded right back by hitting a three ball. A couple minutes later, Palmer hit a three ball, going on a monstrous run that helped put Nebraska on top for the time being. The turning point came though when Butler’s Paul Jorgensen hit a three, turned to the crowd, and put a finger over his lips. Every time Jorgensen touched the ball after that, he was greeted with a chorus of boos. With the fans in a delirium, the Huskers were able to build up a 12 point lead. It was eventually cut down to just 1 point, but Nebraska held on for the win by hitting their free throws down the stretch, 80-76 the final score, ensuring they’ll go on through to face TCU at 8:30 on Sunday. Following the final buzzer, Miles grabbed a microphone, and praised the fans for coming out, and thanking them for donating to the Red Cross relief effort for people being affected by the floods all across Nebraska. He ended his brief speech with an emphatic “go big red.” It might’ve been his last hurrah. But at least for one night, no one was thinking about the future, or the past for that matter. All that mattered was the moment, and it was joyous at PBA.